Millville, NJ – Civilians, Club Members, Active & Retired Military Riders, Street Riders, Track Riders, Mini Riders, Cruiser Riders, Adventure Riders, and Café Racers are all invited to the first inaugural MotoSchoolooza, a rider training expo on September 3, 2018 (Labor Day) at New Jersey Motorsports Park with all profits going to charity. 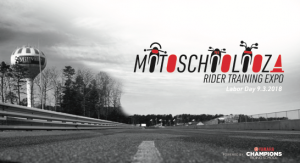 Champions Riding School will be hosting this event with partners and sponsors N2 Track Days, EvolveGT Track Days, NJMiniGP, Alpinestars USA, Dunlop, Chatterbox, and the United States Motorcycle Coaching Association. MotoSchoolooza is not just a riding school, it’s an event with something for every level rider at every budget. Though MotoSchoolooza focuses primarily on its participants, guests are welcome to observe and listen in on the lessons at no cost. Champ School will hold rider clinic stage shows throughout the day on the podium stage at no cost and offer van rides for a small donation during lunch so everyone can get a bird’s eye view of going around a racetrack. If you wish to participate in one of the classes, each is offered in some form and for a discounted rate. Participants should sign up in advance as seats are limited. Guests and fans are welcome. The Champions Riding School, best known for its two-day track-based class named the Yamaha Champions Riding School, aka ChampSchool, is spreading the message about their younger, more economical programs such as ChampDay and ChampStreet. ChampStreet has taken root in the world of cruiser and motor police training while ChampDay forms the basis for our Level III military training. Additionally, MotoSchoolooza will offer a taste of its programs, as well as a Mini program by NJMiniGP. YCRS’s programs are based on the fundamental principles the best riders in the world use, known as Champions Habits. These very habits help all riders to achieve greater confidence and control of their motorcycles the way their design engineers intended. Alpinestars USA is donating three riding jackets, Dunlop is donating three sets of tires, and Chatterbox USA has committed to some communication systems each to be auctioned off with proceeds going to the Road Racing World Air Fence Fund and VetMotorsports. The Roadracing World Action Fund is a 501(c)(3) non-profit organization. Thanks to contributions from friends, fans, and the family of racers as well as from the motorcycle industry, the Roadracing World Action Fund has been able to promote motorcycle racing safety, and in particular, to encourage and facilitate the use of soft air barriers at motorcycle racing events. VETMotorsports honors and empowers disabled combat veterans through active participation. ChampSchool is privileged to be involved with these two worthwhile organizations and will donate all profits from MotoSchoolooza. Please join us as a participant or spectator. More information at champschool.com and click here for the full promo.